Hanukkah is known as the Festival of Lights and there is no better way to help them spend eight glorious nights than with a beautiful Kosher wine gift basket. Filled with entirely kosher, delicious, sweet and savory snacks, this basket will please anyone on your gift-giving list. 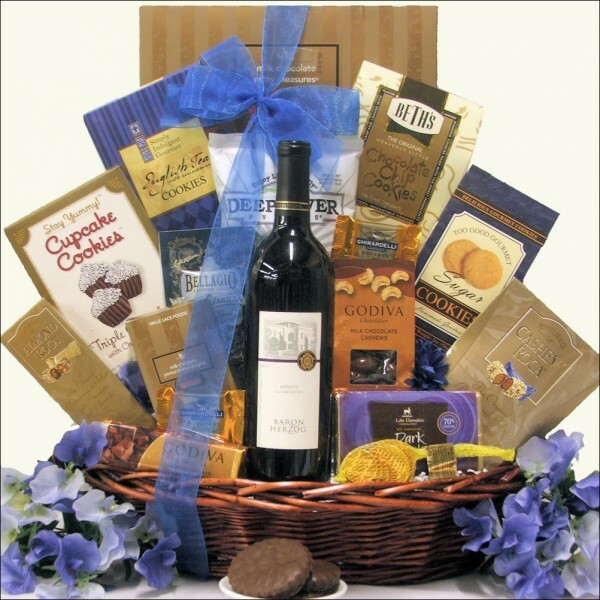 In addition to the featured kosher medium-bodied, fruit forward Baron Herzog Merlot Red Wine, it includes Ghirardelli Milk Chocolate Caramel Squares, Thompson Milk Chocolate Chanukah Coins in a Mesh Bag, Bellagio French Vanilla Gourmet Cocoa, Too Good Gourmet Sugar Cookies and much more. The perfect gift to let them know you are thinking about them during this festive holiday. ...in a Dark Stained Gift Basket with side handles hand-tied with festive ribbon.